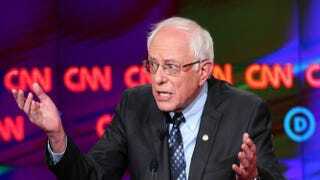 Democratic presidential candidate Bernie Sanders participates in the CNN Democratic presidential primary debate with rival Hillary Clinton March 6, 2016, in Flint, Mich. Michigan voters go to the polls March 8 for the state’s primary. Before the Democratic debate in Flint, Mich., Sunday, critics of presidential hopeful Sen. Bernie Sanders claimed that he didn’t have an intersectional, socioeconomic racial analysis. But after his triggering use of the loaded words “ghetto” and “poor” when answering a question about his “racial blind spots” posed by CNN’s Don Lemon, many of those same critics now believe that he does have just such an analysis—just the wrong one. So to answer your question, I would say, and it’s similar to what the Secretary [Clinton] said, when you’re white, you don’t know what it’s like to be living in the ghetto; you don’t know what it’s like to be poor [emphasis added]; you don’t know what it’s like to be hassled when you walk down the street or you get dragged out of a car. And I believe that as a nation in the year 2016, we must be firm in making it clear. We will end institutional racism and reform a broken criminal-justice system. Not because Sanders isn’t correct, but because I know how those words—coming from either a white liberal or conservative, or even a black person trafficking in respectability politics—strike a discordant chord in the psyches of some black Americans. Still, and regardless of the outrage cycle that began immediately after Sanders’ statement, this is not his Clintonian “superpredator” moment. It was more his Obamian “My grandmother is a typical white person who fears black men” moment. Though both Clinton and Obama evoked white fear of black bodies, which is the prelude to policies designed to control and destroy those bodies, both Obama and Sanders were attempting to illustrate how oblivious most white people are to the realities of being black in America, whereas Clinton was attempting to justify a reality in which more black children would be locked behind bars. The problematic part of Sanders’ statement for me was his continued assertion that the criminal-justice system is broken. As I’ve said many times, the system is functioning exactly as intended—marginalizing exactly whom it was designed to marginalize, targeting exactly whom it was designed to target and killing exactly whom it was designed to kill. … it is not that all black Americans are living in poverty or struggling. It is that black people were intended, as laid out in this Constitution, to be second-class citizens. It is that those who have benefited from this racist racket, despite trafficking in mediocrity, have not had to shift and contort themselves in order to navigate systems of oppression intended for them to fail. When you’re black living in conditions that are at turns glorified, politicized and pathologized, the rules and the mood all change. This is an intricate dance to master, but being so wrapped up in how we are perceived through the lens of white America that we feel compelled to respond to Sanders’ “ghetto” gaffe with reductive tweets intended to deny the depth of poverty that ravages some black communities—or distance ourselves from it—is disingenuous, counterproductive and dangerous. Instead, that opportunity would have been better spent addressing the structural inequities that specifically, purposely and violently target black people and other people of color in this country. There are multiple reasons why Malcolm X’s assertion—“You can’t have capitalism without racism”—is so powerful. Racism is “good” for this nation’s bottom line, and that has always been the true danger of being black in America. We are collateral for the economic risks and machinations in which politicians and corporations wallow. This country has a lengthy and tainted history of recouping its losses on the backs of black, brown and indigenous people. * More than 1 in 4 blacks live in poverty, while less than 1 in 10 whites do. * Nearly half of all single African-American women have zero or negative wealth, and their median wealth is $100—compared with just over $41,000 for single white women. * Black women are the fuel for the prison-industrial complex, with incarceration rates increasing 800 percent since 1986 and black girls being the fastest-growing population of a corrupt juvenile-criminal system. * Black women earn on average 64 cents (pdf) for every dollar paid to white, non-Hispanic men, compared with the 78 cents that white women earn for every dollar paid to white, non-Hispanic men. * States with the most restricted access to abortions, such as Mississippi and Louisiana, often have the highest (for profit) prison populations. * The divestment from traditional public schools under the cloak and dagger of privatized school “choice” has further marginalized students of color, making a token of education in such a way that structural inequities are sure to persist in perpetuity. * From diabetes to hypertension to breast cancer, black people in the U.S. with low incomes are less likely to receive treatment than their white counterparts and more likely to die from lack of access and racial bias, placing huge financial strain on families. * The so-called war on drugs criminalizes communities of color across the country, while politicians and law-enforcement officers have decided to be “gentle” in how they deal with white America’s drug problem. * Lack of reparations for the trans-Atlantic slave trade ensures that, structurally, black Americans are always swimming upstream, at best, or drowning, at worst, in a sea of inequity. Now let’s take a look at what “ghetto” and “poor” look like for most white Americans. Low-income urban white neighborhoods tend to be more stable and less violent than urban black neighborhoods with an almost identical income profile. Black neighborhoods in Baltimore were more likely to be upended by public works projects; highway construction or new railroad lines cut a swath through once-stable communities, sending families scattering. Ninety percent of families that had to relocate because of public works projects were African American. Working-class white kids were more likely to stay in the same neighborhood, fostering stability and extended social networks. With deindustrialization, high-paying working-class jobs all but evaporated. But of those blue-collar jobs that remained, white men were much more likely to find work. Yes, white privilege exists, even if the white beneficiaries of it live in poverty, because being poor and white in this country is one thing, but being poor and black in this country is an entirely different beast. Intergenerational poverty, like everything else in this country, is not colorblind. There’s been a lot of energized, progressive campaigns going way back inside the Democratic Party that the Democratic Party will trash and there are various ways. They did it to Jesse Jackson who had a great campaign going, who was winning primaries in big Midwest states … then they created this disinformation campaign, a smear campaign, about him being anti-Semitic. [Then] Howard Dean, we remember the ‘Dean Scream,’ it was just a smear campaign, and then Dennis Kucinich, going all the way back to George McGovern in 1972. Still, if Sanders continues to step on these racial land mines—unintentionally dog-whistling as he unearths deeply embedded trauma wrought by generations of blackness being pathologized—he might as well pull that kill switch himself.